Starting at the Hwy 84 & 16th Ave Intersection, go West 6.2 miles. Turn right onto Hwy 29N, go 4 miles. Before sharp right turn, continue straight on Northridge Rd., go .8 miles. Turn left onto Bernis Hill Rd., go 2.2 miles. 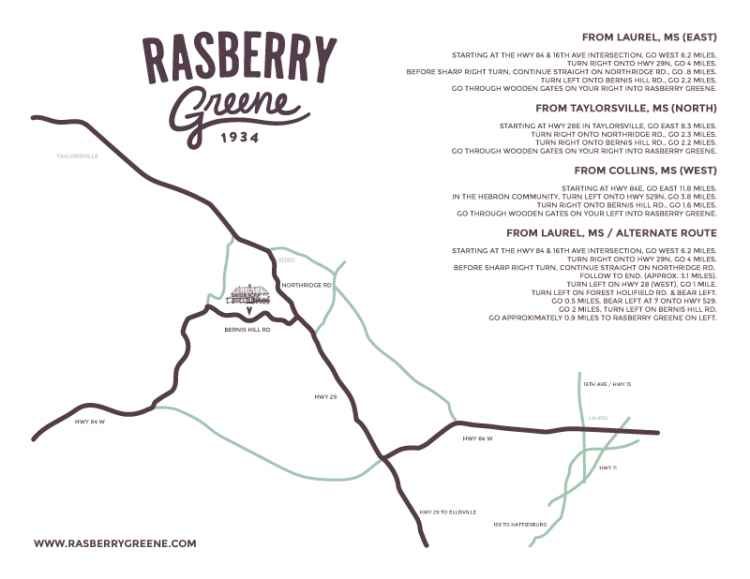 Go through wooden gates on your right into Rasberry Greene. Starting at Hwy 28E in Taylorsville, go East 8.3 miles. Turn right onto Northridge Rd., go 2.3 miles. Turn right onto Bernis Hill Rd., go 2.2 miles. Starting at Hwy 84E, go East 11.8 miles. In the Hebron community, turn left onto Hwy 529N, go 3.8 miles. Turn right onto Bernis Hill Rd., go 1.6 miles. Go through wooden gates on your left into Rasberry Greene. Before sharp right turn, continue straight on Northridge Rd, follow to end. (approx. 3.1 miles). Turn left on Hwy 28 (west), go 1 mile. Turn left on Forest Holifield Rd. & bear left. Go 0.5 miles, bear left at 7 onto Hwy 529. Go 2 miles, turn left on Bernis Hill Rd. Go approximately 0.9 miles to Rasberry Greene on left.